Given the wet conditions being experienced around the country at the moment. Getting fertiliser spread, particularly urea at its optimum date for initial application, between mid-January and mid to late February can be a challenge on many farms. 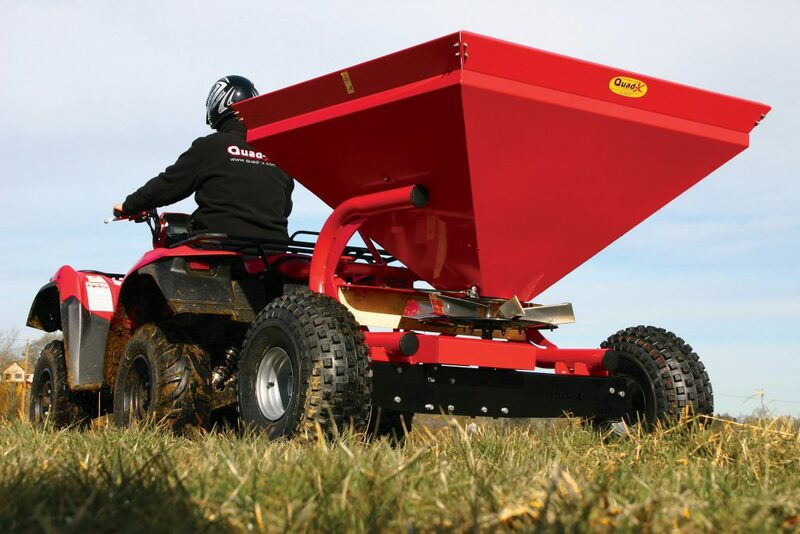 With this in mind Quad-X have developed a plastic coated ATV sower which it says has the lowest fill height of any ATV fertiliser spreader and saves back-breaking stretches to reach the hopper with 50kg bags balancing on your shoulder. It claims average man can fill the Quad-X 7 bag sower with the bag lifted to between waist and chest height. 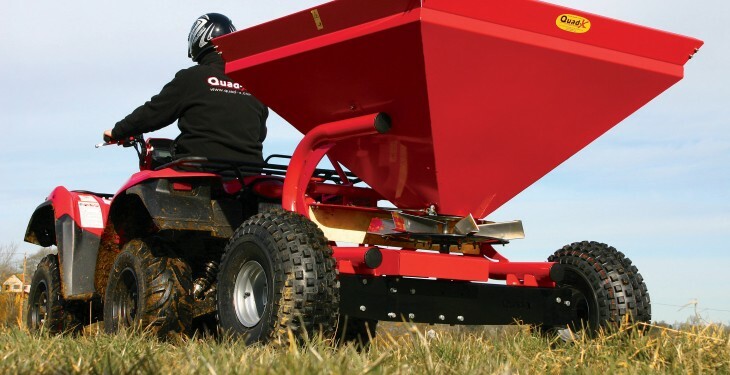 The company says with 350kg capacity and optional extension sides to carry 500kg or 600kg the Quad-X sower is ideal for using with large half ton or 600kg bags of fertiliser. This machine is ground driven and has an unrivalled spreading width, which is easily adjusted by regulating the towing vehicles speed. The steel frame and hopper is strong and sturdy and avoids any problem of cracks that can appear in plastic hoppers. A plastic coated finish ensures excellent resistance to the corrosive nature of fertiliser making the sower superior than galvanised versions. Quad-X says in response to the request for a stable sower that can work in wet conditions, the Quad-X spreader has an extra wide axle which coupled with the low height of the hopper makes for a sower that is very stable. Flotation tyres make the sower suitable for softer ground. Quad-X have also recently re-engineered their handy 6 bag sower to comprise 12 product improvements, including knobby tyres, wider wheel base and dished spinner for excellent spread widths. Another option from Quad-X is its Electro-Broadcaster which is designed to sow a wide range of seeds, granular fertilisers and slug pellets. The motorised spreader is the ideal size to sow a 50kg fertiliser bag, with a 25kg model also available. The Electro-Broadcaster is fitted with a low-profile powerful 12 volt motor attached to the spinner. It comes complete with a universal easy-mount system, with a revised lower mount position for optimum spreading up to 24m. The company claims Electrobroadcaster can be easily fitted to your ATV and connects directly to the battery, yet it can also be fitted to a tractor with an optional remote shut off. The company says the plastic hopper is UV stabilized and durable while the stainless steel spinner and shutter plates help reduce corrosion. Variable shutter settings suit the application rate required, to minimise wastage and save money.